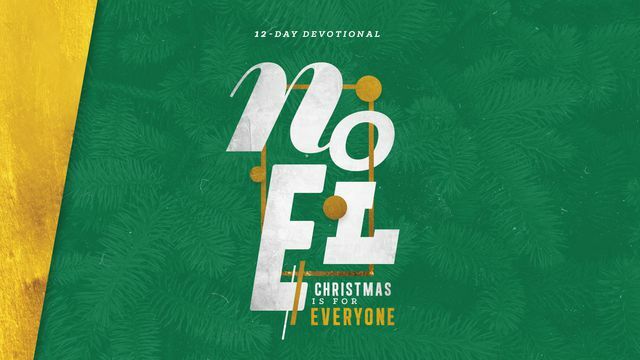 Noel: Christmas Is For Everyone - Over the next 12 days, we’re going to take a journey through the Christmas story and discover not only why it’s the greatest story ever told, but also how Christmas is truly for everyone! What’s the first thing you learn about someone when you’re introduced to them? Their name! Why? Because names help us remember people, to identify them, to know who we’re communicating with or referring to. Back in the day, names used to mean something. Nowadays, many people seem to name their kids based on what name they think is pretty or cool or popular, rarely looking deeper at the origins and etymology of the name or its cultural significance and heritage. In ancient times, names were given for special reasons. Isaac (“he laughs”) was named because of the laughter of Abraham and Sarah when God told them they’d have a son in their old age. Jacob (“he grasps the heel”) was given his name because he was born “with his hand grasping Esau’s heel” (Genesis 25:26 NIV). The Greek word we see here for Word is logos. The concept of logos is a powerful, complex, and beautiful idea. The simplest way to explain the Greek philosophy behind it is that logos is the reason or unspoken rationale behind something. The term essentially describes a collection of things put together in thought and expressed in words. It is considered the universal reason inherent in all things; the binding laws that sustain all in existence. In Hebrew culture, this idea refers to the dynamic force of God’s will. They often use the term memra—a word derived from the Aramaic word for “speak”—to describe God’s creative activity and will. So in John 1:1 (NIV) when it says, “In the beginning was the Word, and the Word was with God, and the Word was God,” the apostle is telling us that Jesus Christ, the Son of God, is the living embodiment of the Word of God. He is God in the flesh, the image (eikón: supreme expression, reflection, and representation; mirror image) of the invisible God (Colossians 1:15); the One who spoke the will of the Lord into being in the beginning (Genesis 1:1–2; Psalm 33:9; Hebrews 11:3). He is the character, heart, will, and mind of God the Father revealed to the world. He is, as the Greeks believed, the universal reason inherent in all things (John 1:3); the binding laws that sustain all in existence (Colossians 1:15–17). And guess what? John 1:14 (NIV) tells that the Word, He who holds the universe together and through whom all of creation came into being, “became flesh and made his dwelling among us.” This is what the Christmas season is all about. God became man! He loves us so much that He left heaven to make a way for us to enter heaven and spend eternity with Him! This is why in Matthew 1:23 (NIV) we see the angel declare to Joseph, “They will call him Immanuel" (which means "God with us"). The Son of God was sent to reveal His Father's thoughts and heart—His Word—to the world . . . and to save us. This is why the angel instructs Joseph to name Him Jesus (Yeshua: God is salvation) “because he will save his people from their sins" (Matthew 1:21 NIV). As we get ready to celebrate Christmas in a few days, remember that Immanuel, our precious Jesus, the eternal Word, our King and Savior, came to Earth so we could know God deeply and experience His presence intimately, and so we would be saved. He came to freely give us “the right to become children of God” (John 1:12 NIV). Tomorrow, we’ll learn why God had to come . . .